Hygiene Toolkit – By Intercare Limited ..
“Wipe them dry” has been launched by Intercare to educate people on the importance of keeping hands clean in order to stay healthy and prevent the spread of germs. Hands are amazing tools. We use them almost all the time, and this makes them very exposed and vulnerable. For example, bacteria can survive on common surfaces such as taps for up to 72 hours. “Wipe them dry” is all about washing and drying our hands. Washing with liquid soap helps us to remove the most harmful germs, but not all. 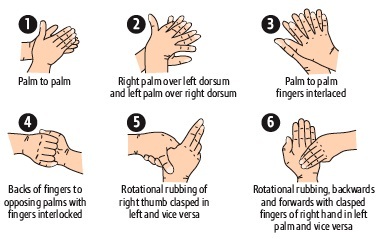 Germs love wet or moist hands so if we forget to dry them the remaining germs on our hands multiply rapidly. Thoroughly washing and drying our hands can remove up to 99 per cent of all germs, which is why we say clean hands are safe hands. + After arriving at work. + Before meals or eating food. + After visiting the toilet. + Before and after visiting a sick person. + When hands are visibly dirty. + Avoid touching your eyes, nose or mouth to avoid cross contamination. + Be careful about close contact such as shaking hands or kissing people on the cheek and avoid close contact with people who are ill.
+ Cough or sneeze against your sleeve or in a paper tissue, then throw this immediately into the bin. Hygienic washrooms and good hand washing facilities can play a major part in helping to reduce sickness, both at home and at work. As most of us know maintaining a clean and hygienic washroom at home is an important part of keeping our families safe. But hygiene is particularly important in the workplace where infections may quickly spread, leading to mass absenteeism and therefore a loss of productivity. Overall loss of output due to non-injury ill health was estimated to be between £7.01 -10.24 billion in Great Britain in 2004. + Soap and lack of adequate hand drying facilities are the most common factors to be missing or to have run out. Soap does not have to be antibacterial in most office/home situations. The method for drying hands is of more importance: warm air dryers may not dry hands adequately and a hot or jet air dryer can disperse microbes around the washroom. While some of the latest dryer designs have increased efficiency, the ideal solution is to offer a disposable hand towel supply, especially during outbreaks. + If the toilet paper is missing in a cubicle the user may have to come out, hunt for a roll and return – it doesn’t take much imagination to assess the increase in contamination of handles etc. + Office kitchen assessment includes a safe drinking water/hot water supply and washing-up liquid, soap and hand drying provision. + If the office has a water dispenser or water cooler, the hygiene check will depend on whether the water tank is connected to the mains supply or the tank is changed by a supplier. The washroom at work should be a functional, hygienic and pleasant environment since most of us are not prepared to stay in an unsanitary washroom any longer than necessary. If we are loathe to linger, hand hygiene may become quite cursory – particularly if inadequate hand washing facilities are supplied. Since the washroom is an important part of the workplace environment it makes sense to ensure that it is a hygienic and user-friendly facility. This helps to increase productivity and boost staff morale while also reducing the threat of infections. Good hygiene is particularly important in schools. Toilets and washrooms should be clean and well ventilated. They should also be cleaned regularly as part of a documented cleaning rota and policy. + Toilets should be clean, in good repair and monitored regularly. For example, an audit checklist should be located in the toilets and this should be dated and signed at regular intervals. + All toilet areas should have hand washing facilities including warm and cold running water, soap and towels. Liquid soap & paper towels are recognized as the most effective hand washing method. Liquid soap, unlike bar soap, is less likely to become contaminated. + Ideally liquid soap should be housed in wall-mounted dispensers and disposable cartridges are considered to be the “gold standard”. Liquid soap that is “topped up” can become contaminated. + Some schools use roller towels or hand dryers. Ideally paper towels should be used. However, if roller towels or hand dryers are provided they should be regularly maintained, changed or cleaned. + General bins (for paper towels etc) in toilets should be foot-operated.